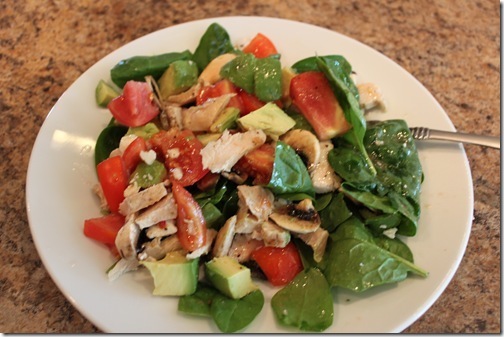 Grilled Chicken Salad Recipe for Mom! With all of the Mac-n-Cheese and chicken nugget requests around here, I really needed a lunch idea that I could throw together easily for me! Now, I know you all don’t need me to tell you how to make a scrumptious salad for yourselves, but maybe just a little inspiration to remind you how easy it can be! So for those of you out there yearning for something other than kid food for lunch, here we go! My husband started eating healthier and grilled up a bunch of chicken breasts to take for his lunches. When I went searching for lunch one day I spotted them! I think this is a key part to this recipe, because if I can find something healthy and ready to go in my fridge then I’m all over it! Optional: If you don’t have grilled chicken, you can substitute sliced ham or turkey. I like Oscar Meyer Deli meats, they are about 50 calories for 6 slices! Combine all ingredients on a plate, toss on some of your favorite dressing, and enjoy your healthy mom lunch! Chicken breast, raspberries, almond slides with the raspberry vinaigrette. Tomato, basil, mozzarella chunks with balsamic vinegar and a splash of olive oil. Diced ham, turkey, tomato and avocado with Italian dressing. Chicken Breast, mandarin orange slices, almond slices, and chopped green onion with balsamic vinegar and a splash of olive oil. Have a favorite quick salad idea to share? Leave it in the comments, we love variety! You are right – salads are super simple to make! Normally I like salads but this pregnancy, not really. And I prefer warmer lunches as fall is coming on. One of the yummiest, quickest lunches I can make for myself is making a wrap out of leftover roasted vegetables (usually there are mushrooms in there for protein – if not, throw in some leftover meat if you want). Depending on the veggies I’ll add spinach as well (added after heating but it’ll still wilt some). The flavors of leftover roasted veggies are so much better than the day you make them and lends to a very satisfying meal! Have to share a to-die-for dressing twist before my 5 boys wake up and expect me ready for our school day (so please OCR look any early morning spelling/grammar issues). Buy those Italian dressing mix packets. Substitute the vinegar with balsamic vinegar. Mix and serve. You will Love it! This is great! I soooo needed this. I often am left scratching my head or with an empty stomach when it comes to lunch. I will definitely be using some of these ideas. I just started reading your blog yesterday, I am homeschooling my 2 kids, ages 8 & 9, here in Mexico. We decided on homeschooling here because the education system here has alot to be desired even in private schools. Mexico doesn’t have a home school program so, I keep the kids enrolled in the program in the US with our address there. I was looking for fun lesson plans online and viola! I found your blog among other great homeschooling blogs! I just wanted to introduce myself, quickly. I look forward to reading more about your homeschooling experiences. Feta would be great in chicken salad! I love to make chicken salad in the summer. I need to try your fall version. We love the grilled chicken strips at our local store (Market Basket or Shaws) and they work great in a lunch like this! !